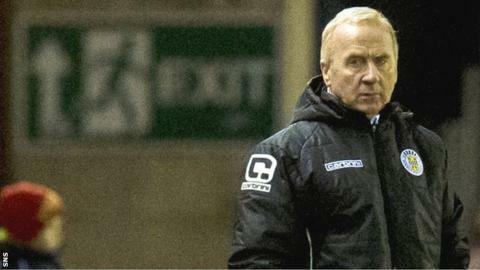 St Mirren were hampered by a lack of confidence in their comprehensive at Inverness, says manager Tommy Craig. The Buddies boss told BBC Scotland: "We looked totally bereft of confidence from the very first goal. "Once that went in you could see our confidence draining. Under current circumstances you can understand why. "On the night we were beaten by a much better team. We can't afford to give a goal away, let alone four." That would have been a welcome reprieve from the pressure of fighting for their Scottish Premiership place. "When you play with that lack of confidence it only leads to trouble." However, Inverness goalkeeper Dean Brill was a spectator for much of the match as his team-mates scored two first-half goals through Gary Warren and Greg Tansey, the latter from the spot, and Danny Williams and Graeme Shinnie made it 4-0 by full time. "When you play with that lack of confidence it only leads to trouble," added Craig. "What highlighted our lack of confidence was their refreshing look of confidence. They are joint [Scottish Premiership]leaders with Celtic and you can see exactly why. They are a really good team. "Hopefully we can get ourselves back on track on Saturday. We've got St Johnstone at home and we'll need to put up a much better performance than we did tonight." St Mirren have been boosted in recent days by the return of key players but Craig guarded against expecting too much from them straight away. He said: "To be fair to Stevie Thompson, Isaac Osbourne, John McGinn and Jim Goodwin, they have all come back from lengthy lay-offs so I wasn't too surprised at how ineffective we were as a team. "These boys will need two or three games under their belt before they are back to their best." Asked about the St Mirren fans' criticism of his managerial reign, Craig asked them to "come along and support the players" and added: "On tonight's performance they obviously have their concerns and no wonder."